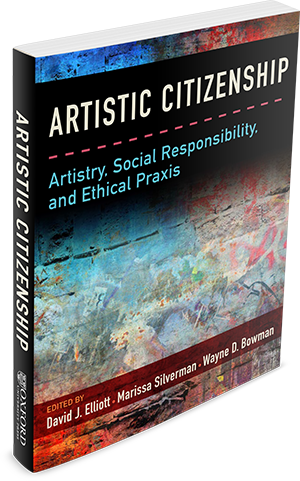 “In what ways do our artistic endeavors implicate responsibilities to each other and to our collective human identities?” We pose this question in our book, Artistic Citizenship: Artistry, Social Responsibility and Ethical Praxis. 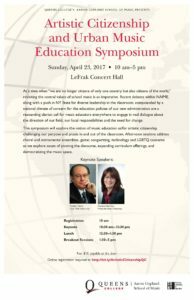 This provocation provides a point of entry for this symposium as we explore the notion of music education as/for artistic citizenship, challenging our purpose and praxis in and out of the classroom. Afternoon sessions address choral and instrumental ensembles, guitar, songwriting and technology in the classroom as we consider pivoting the discourse, expanding curriculum offerings, and democratizing the music space. “Artistic citizenship” is a concept with which we hope to encapsulate our belief that artistry involves civic-social-humanistic-emancipatory responsibilities, obligations to engage in art making that advances social “goods.” The terms artist, artistry, and artistic as we use them are not elitist. By “artists” we mean to include people of all ages (from youth to adults) and levels of technical accomplishment (from amateur to professional practitioners) who make and partake of art(s) of all kinds, in contexts ranging from informal to formal, with the primary intent of making positive differences in people’s lives. Whereas artistic proficiency entails myriad skills and understandings, artistic citizenship implicates additional commitments to act in ways that move people—both emotionally and in the sense of mobilizing them as agents of positive change. Artistic citizens are committed to engaging in artistic actions in ways that can bring people together, enhance communal wellbeing, and contribute substantially to human thriving. What does “citizenship” mean and how might these meanings relate to our understandings of the privileges and obligations that attend artistic practices? How might “artistic citizenship” differ from (or resemble) citizenship in general? In what ways and to what extent do art-makers and art-takers have responsibilities (or obligations) to deploy the potentials of the arts to advance social justice, human rights, and the like? What personal, social, cultural, educational, political, therapeutic, economic, and health-giving “goods” can artistic engagements (amateur or professional) facilitate? What ethical issues and responsibilities attend the concept of art making as force for advancing positive social and political change? How might artistic citizens engage the “general public” in artistic projects designed to serve diverse public, social, cultural, political interests? How can ethically-oriented artistry contribute to the mitigation of racism, sexism, ageism, classism, and ethnocentricism, and other forms of social injustice? What abilities and dispositions of body-mind and heart do amateur and professional artists require if they are to engage in, develop, and expand the possibilities and potentials of artistic citizenship? What historical precedents can inform and refine our understandings of the “why, what, how, who, where, and when” of artistic citizenship? What are the most effective strategies and tactics that artist-activists (or “artivists”[i]) to confront problems like racial violence, poverty, disease, discrimination, and the like? What are the specific or distinctive potentials of particular artistic endeavors for fulfilling the commitments and responsibilities of artistic citizenship? How can school and community arts education programs develop young people’s habits of heart and mind in and through socially responsible art making? Additional questions and issues emerge from the chapters in the book, questions too numerous to list here. But the questions, discussions, and actions to which the book’s essays lead will be the ultimate measure of this project’s significance. We leave it to our readers, then, to carry these conversations forward—to follow the leads offered by contributors to this volume. Although we cannot know precisely the form those ideas may eventually assume, it is our hope that they will involve continuous critical dialogue across artistic disciplines about the ethical potentials of artistry, the nature of artistic responsibility, and the remarkable capacities of art to improve our neighborhoods, our societies, and our world. [i] The concept of “artivism” and therefore “artivist” can be found in Rodney Diverlus’ chapter (in this volume) and also Chela Sandoval and Guisela Latorre (2007). Chicana/o Artivism: Judy Baca’s Digital Work with Youth of Color, in Anna Everett (Ed.) Learning Race and Ethnicity, (pp. 81-108), MIT Press. Violent hate crimes have surged around the world, including the U.S., where disgusting racist, homophobic, and misogynist language has become normalized in political speeches and on social media, where violence has become routine, and where free speech and other democratic freedoms are under threat. As the authors of the 27 chapters in Artistic Citizenship document, artists of all kinds around the world are putting their art-making to work for social “goods” by “calling out” and protesting anti-democratic and anti-human behaviors. (Note: By “artists” we mean amateurs and professionals in all the arts, arts educators, and students involved in art-making for active social justice). 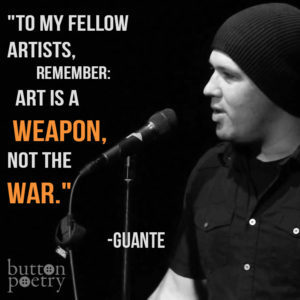 Guante is a hip-hop artist, a two-time National Poetry Slam champion, an educator, a writer, and a contributor to Artistic Citizenship. He has “performed for justice” widely in the U.S. and abroad—from the United Nations, to the Soundset Hip-Hop Festival, to countless colleges, universities, clubs, theaters, and rallies across the U.S. His performances have been featured on BBC Radio 6-Music, MSNBC, Upworthy, Everyday Feminism, and Button Poetry. And he facilitates community workshops that use the arts as jumping-off points for deeper conversations about identity, power, empathy, and agency. Many other examples by Guante and his colleagues are available on his website. Hopefully, such conferences will actually lead to “enacting” social justice in the sense of actual participation in public contention, acting for social justice, doing it, performing it, and creating “ethical spectacles” of/for social justice. As David has emphasized in several articles and conference papers over the last 10 years—see “Socializing Music Education“; “Artistic Citizenship as/for Music Education“; and “Canadian Music Schools: Toward a Somewhat Radical Mission“—“raising people’s consciousness about their oppression through reflection and talk is not enough: Physical and emotional support for actual participation in public contention is required” (Anyon). “Intellectualizing,” does not, by itself, move people—physically and emotionally—to take meaningful action for social justice. In 2016, the world lost three musical legends and LGBT icons: David Bowie (1947-2016), Prince (1958-2016), and George Michael (1963-2016). George Michael represented a walking middle-finger-up in the faces of those right wing mouthpieces that would desexualize gay men, sanitizing our existence and barely concealing their disdain and, frequently, their outright disgust at the mere thought of gay men interacting sexually with one another. People do a serious disservice to activist artists of all kinds—or what we call artivists—when they attempt to sanitize or depoliticize musicians’ lives and legacies. Instead, let’s celebrate all three men as musical-social icons: extraordinary people who made major differences in the lives of LGBT individuals and communities worldwide. Granting this award to Bob Dylan signifies important things. First, songs and their lyrics are as much poetic devices as “pure” poetry. This thinking dates back to ancient Greek poets, who recited their poetry to music. In fact, and because of this, ancient Greek poetry is not so much thought of as collections of “poems,” but as “songs.” In Greek times, the culture of poetry was the culture of song. Bob Dylan is being recognized for carrying forward this ancient tradition. Also, and while the Academy recognizes Dylan’s contribution to the fields of folk, rock, pop music, and popular culture, this Nobel Prize signifies something important for artistic citizenship. Dylan’s songwriting oftentimes took an activist stance. Indeed, Dylan felt that songs could and would change the world. As David Yaffe notes, once Dylan got involved with CORE (Congress for Racial Equality), “he began writing songs about Emmett Till, Hattie Carroll, and James Meredith.” He created “words that would be belted out at the March on Washington by Peter, Paul, and Mary ‘How many years can some people exist until they’re allowed to be free.’” And while Dylan’s musical “art-ivism” ebbed and flowed throughout his career, his songs remain and continue to powerfully engage and transform the world. Equally important, the Academy’s move shows that distinctions between so-called “high art” and “low art” are arbitrary categories that are no longer useful. Indeed, Dylan’s poetic songs engage in/with the world and do worldly work. “The times they are a changing,” sang Dylan. Yes, they have. Congratulations to Bob Dylan, poet of America for the world! What is the role of architecture? What do we need architecture to be? What does the world need today? There are many examples of architects who ask the above questions. One such architectural group is TYIN tegnestue. Established in 2008 by Yashar Hanstad and Andreas G Gjertsen and based out of Trondheim, Norway, the firm works towards social sustainability and pragmatic creativity, or, what they call their projects, “architecture of necessity.” The young architects have been involved in diverse projects, from attempts at improving poor areas in Bangkok, to a Sumatran training center and original projects in Norway. 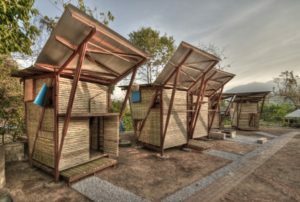 The architectural firm travelled to the Thai-Burmese border to create dormitories for Karen refugee children. 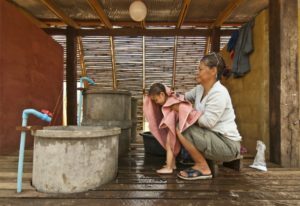 The main driving force behind the Soe Ker Tie House was to provide the children with their own private space, a place that they could call home and a space for interaction and play. The arts are hubs of social, emotional, personal, and worldly interactions. Any values we derive from or experience through the arts occur because we engage in and feel the results/benefits of art making and art experiencing. So, “we make it true” that one or more values happen in/to us when we participate with the arts. What values are possible? The chapters within this book yield a multitude of possibilities. And artistic citizenship is the concept we employ that connects and extends such possibilities. From illuminating public places to visionary activism through art-making to creating art that examines a world that isn’t but could be, artistic citizenship shows itself in a variety of ways.